While constructing the Modellbundesbahn, it wasn`t the first priority to built the biggest or most famous model railway layout. 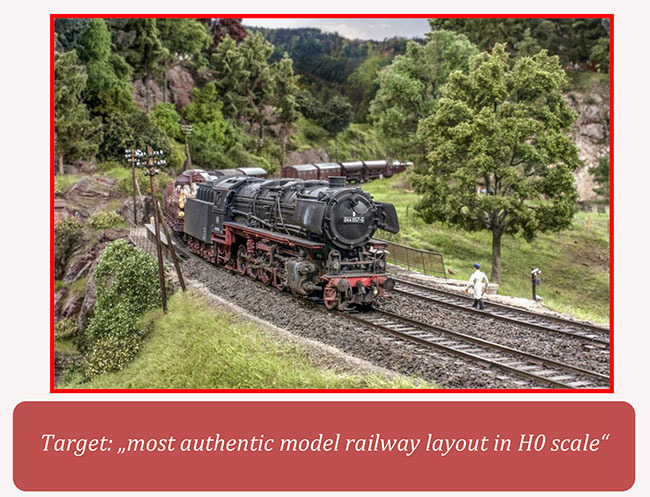 We`ve tried to hit the target to create the most authentic model railway layout in H0 scale. The Modellbundesbahn is an idea and a concept of keeping the steam age of railways for the posterity, as it was seen at the “Deutsche Bundesbahn” in the summer of `75. Certainly scaled down 87-fold. On the contrary to many other model railway layouts, which are presented in Germany, this HO scale display is an accurate and historically correct scale model of Ottbergen railway station and its locomotive shed as they were in 1975. Buildings, locomotives and trains are carefully weathered. There are no high speed trains. No, there are freight trains, local passenger trains and a lot of railway traffic. Miniaturized the Modellbundesbahn helps the steam train drivers to win new achievements! The operations are based on the knowledge of local historians and retired railwaymen with direct experience. The programmer of the Modellbundesbahn, Norbert Sickmann, has developed the ability to exchange locomotives and modify train formations automatically. He uses the invention of remotely-controlled intelligent digital couplings from the manufacturer T4T, in order to be able of replicating prototypical operations even more accurately. Brakel is on the B64, east of Paderborn, about 90 minutes drive from Dortmund. The station is now served by Nordwestbahn diesel railcars running between Paderborn and Holzminden (timetable RB84, the Eggebahn).